Shot by Ma Xuefeng. Edited by Ma Xuefeng. Subtitles by Wang Xinzhou and Andy Boreham. 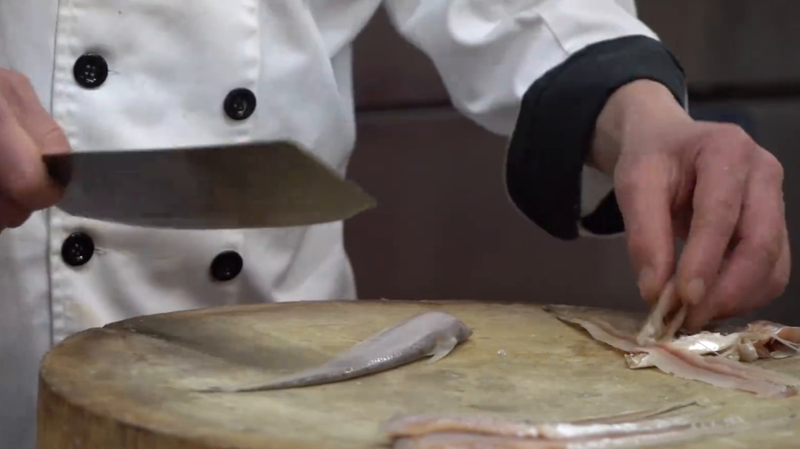 The knifefish is a pricey ingredient that happens to be in season right about now. Knifefish dishes are only available for a limited time, normally during March and early April (before the Qingming festival). There are three types of knifefish, depending on its origin — river, sea or lake. Among them, those from the Yangtze River are the best in terms of texture and flavor. But recent years have witnessed a sharp decline in the number of Yangtze knifefish due to over-fishing. This year, the government imposed a ban on fishing Yangtze knifefish to protect it from demise. This time, we are enjoying a feast of dim sum with ocean knifefish, with an added burst of umami flavor and an overall light taste, perfect for wakening your palate for the spring. 1. The Vibe: Xin Zhenjiang Restaurant, situated in the heart of Nanjing West Road, is reknowned. Despite the slightly dated décor, there are floor-to-ceiling windows through which you can enjoy a view of vibrant Shanghai. 2.	Who goes: This place is quite popular with families, the elderly and groups of friends willing to try something classic. It may not be the perfect spot for private conversations. 3. Language: There’s no English service for now, but the menu comes with pictures and orders can be made directly on a supplied iPad. 4. Opening hours: Monday to Sunday, with lunch from 11am to 2:30pm and dinner from 6pm to 9:30pm. Be prepared for a long queue, even on weekdays. The famous green wontons are available for take-away at the restaurant and from another branch, located on North Shaanxi Road. Known as a superior and original dish, the meat is super tender, and the unique umami flavor lingers on your tongue. Be careful with the tiny fish bones, although they are relatively soft during this time. This one is a little bit chewier than the wontons, although the filling is still soft, which makes it satisfying to bite through. This fusion dish — a pile of knife fish meat on a thin but crispy layer of bread — is probably the easiest to start with for foreign palates. This is a super slim version of the traditional spring roll, which gives it an extra crispy bite. This is what we came for in the first place! The eye-catching green color of these wontons comes from the spinach, which adds to its refreshing taste. In a stunning orange color, these give a burst of flavor, with a hint of sweetness from their wrapping, and a savory hint from the meat inside. Despite its bizarre appearance, the white flakes on this fish meat ball have no taste. Overall the courses we tried were light and satisfying. If you prefer more complex flavors or food with more of a kick, there are other options such as sweet and sour fried fish balls. 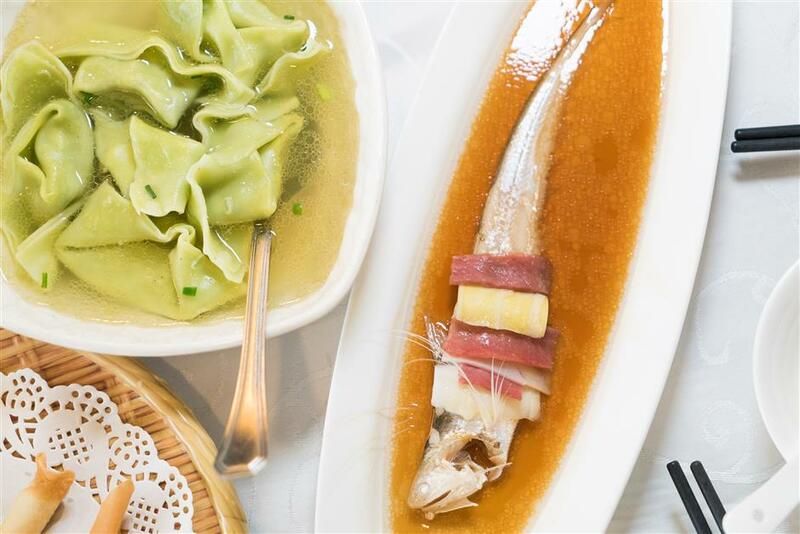 The sheer varieties of courses featuring knifefish at Xinzhenjiang might come as a surprise. Check out the video to find out exactly how the dim sums are made.